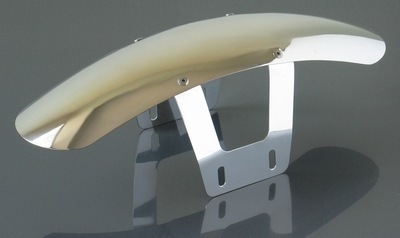 Shorty 304 stainless steel front fender specifically designed to fit the Honda Clubman GB500 & GB400. May be suitable for other models with 55mm on center mounting holes. This highly polished shorty front fender gives a retro cafe racer look and offers significant weight savings over the stock fender. Overall length 400mm. Width 100mm. Sturdy stainless steel stays provide secure mounting to the fork sliders. Note that the rivets are easily removed, allowing the stays to be mounted on top of the fender if you prefer that look.